7 days till Christmas!! Wow, where did the year go? I hate saying this cause it makes me sound old, but, it seriously feels like my kids just started school. Craziness!! Luckily, I finished my shopping and wrapping. So this week I’m back to cooking. I made these for my friends graduation party this week and they turned out really yummy. Kind of spinachy, but the cheese softens the bitter spinach taste. And the phyllo dough adds a really yummy flaky crunch. Different, but still really yummy. Would be a great party appetizer to contrast all the sweets. Enjoy!! Heat a large saute pan over medium high heat. 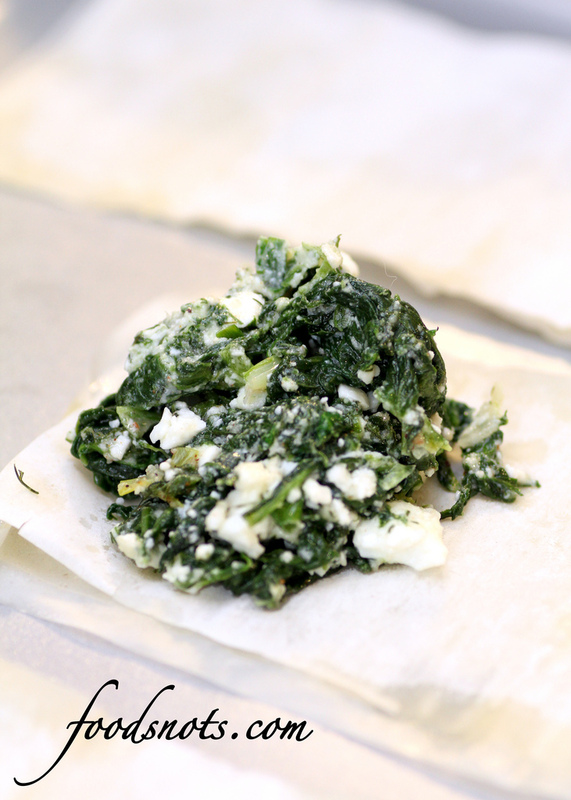 Add a few large handfuls of the spinach and cook, tossing gently with tongs. As the spinach starts to wilt, continue adding the rest a few handfuls at a time. Cook until all the spinach is wilted and bright green, about 4 minutes. With a slotted spoon, transfer the spinach to a colander set in a sink. Let cool slightly and squeeze with your hands to extract as much of the remaining liquid as you can. Wipe the pan dry with a paper towel. Heat the oil in the pan over medium heat. Add the scallions and cook until soft and fragrant, about 4 minutes. Stir in the spinach, turn off the heat, and let cool for 5 minutes. Then stir in the cheeses, dill and nutmeg and mix thoroughly. Preheat oven to 350 degrees F. In a small bowl, mix the butter and olive oil. 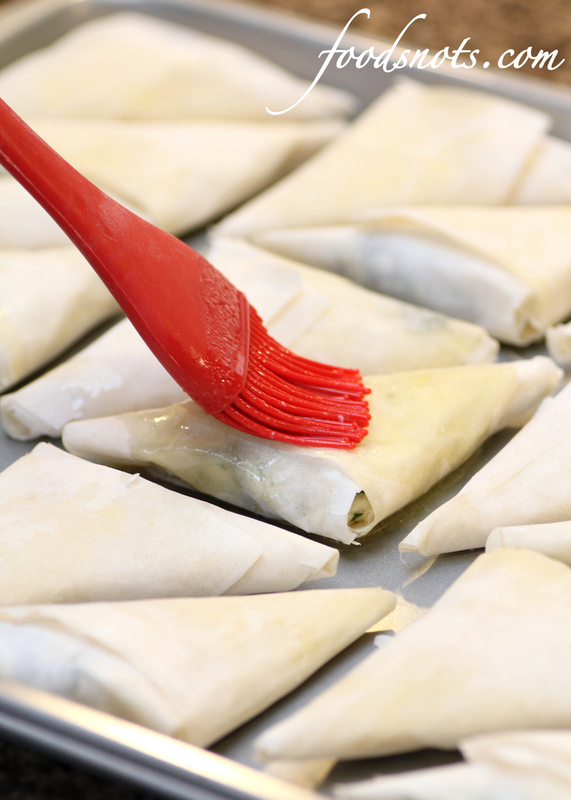 Separate out 3 sheets of phyllo and keep rest covered to avoid drying out. Brush each sheet with butter mixture and lay on top of the another (buttered side up). Cut into equal thirds lengthwise. Spoon a little filling, about 2 tablespoons, on the end and fold at an angle to form a triangle. Continue folding to enclose the filling until you reach the end (like how you would fold a flag). Assemble on a baking sheet and brush the tops lightly with butter mixture. Bake triangles for 20-25 minutes or until the pastry is golden brown. Altered recipe from Fine Cooking Pies, Crisps & Cobblers.